Thousands of people from around the globe are expected to return to San Diego later this month to participate in the world’s largest event dedicated to presenting and exploring new ways technology can assist people with disabilities. California State University, Northridge’s 32nd annual conference has adopted a new name and brand — the CSUN Assistive Technology Conference — to highlight the true nature of the event (it was formerly known as the International Technology and Persons with Disabilities Conference). The conference is scheduled to take place from Feb. 27-March 4 at the Manchester Grand Hyatt Hotel in San Diego. People with disabilities make up the largest group of attendees and “are the reason we all gather to push the research and challenge industry professionals to keeping moving technology forward and to tackle new challenges,” said Sandy Plotin, managing director of CSUN’s Center on Disabilities, which organizes the conference each year. The “CSUN Conference,” as it is known in the industry, is the only one of its kind sponsored by a university. It provides a unique opportunity for people with disabilities to have direct input on the creation of — or modifications to — assistive technologies intended to make their lives easier, such as wheelchairs, interactive software and apps. “Our conference brings together thousands of people from around the world — including scientists, practitioners, educators, government officials, tech industry executives and entrepreneurs — all committed to driving innovation in assistive technology to promote inclusiveness for people with disabilities,” Plotin said. The conference explores all aspects of technology and disabilities, and features a faculty of internationally recognized speakers, more than 350 general session workshops and more than 130 exhibitors displaying the latest technology for people with disabilities. 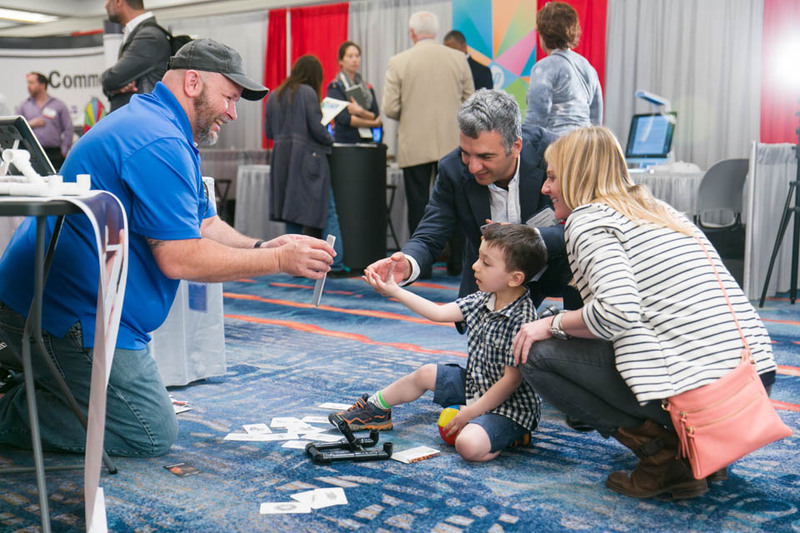 This year’s sold-out exhibit floor has added a variety of first-time exhibitors from all different facets of assistive technology and services. The CSUN conference Exhibit Hall is open to the public, free of charge. Throwing a spotlight on the research generated by the conference, organizers will publish “Journal on Technology and People with Disabilities,” which features proceedings from the conference’s science and research track. This year will mark the journal’s fifth edition. Dr. Kellie Lim, a physician at UCLA Health specializing in the field of allergy and immunology, will give the conference’s keynote address at 5:30 p.m. Tuesday, Feb. 28. Born and raised in Michigan to a Chinese immigrant family, Lim has firsthand experience in the difficulty of accessing medical care, especially for those with severe physical disabilities and limited resources. At age 8, Lim contracted bacterial meningitis that led to life-threatening sepsis. The infection caused widespread damage to her body. She underwent amputations of her legs, right arm, and several fingers of the left hand. Lim had to re-learn basic daily activities, such as eating with utensils, writing and walking. The experience inspired Lim to pursue a career in medicine. She had to convince schools that she was capable of mastering the rigors of a medical education. She completed her medical training at UCLA, including a residency program in pediatrics and a fellowship program in the medical specialty field allergy and immunology. Lim also completed a fellowship in clinical pharmacology and a master’s degree in clinical research. The conference’s annual Strache Leadersehip award will be given to University of Colorado at Boulder computer science professor Clayton Lewis, to recognize his work in education and research in the field of disabilities. Lewis will receive the honor at the keynote address on Feb. 28. Lewis’ research has contributed to cognitive assistive technology, programming language design, educational technology, and cognitive theory in causal attribution and learning. For more information about the conference or how to register, visit CSUN’s Center on Disabilities website at http://www.csun.edu/cod/conference/index.php or call the center at (818) 677-2578 V/TTY. California State University, Northridge has a long history of involvement in many aspects of assisting people with disabilities, dating back to 1961, when the university was known as San Fernando Valley State College. This precedes Section 504 of the Rehabilitation Act of 1973 and the Americans with Disabilities Act of 1990. In 1983, university officials created the Center on Disabilities to directly help students to realize their academic and career goals. To that end, CSUN launched the technology and people with disabilities conference. Over the years, the conference has grown to about 5,000 participants, with presenters and exhibitors sharing devices, services and programs. Participants come from all 50 states, numerous territories and more than 35 countries. It has an international reputation for expanding the knowledge base of professionals and introducing newcomers to the field.